Ben was born and raised a child of the church. He is both a multi-generational Zoni as well as a third generation pastor. 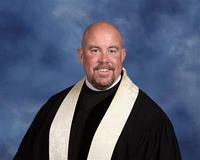 He is serving in his 21st year of ministry in the church and 13th as an ordained pastor. He comes from a background of mainly classical music having traveled internationally as an opera, oratorio and musical theatre singer. He received a Bachelor in Music at Arizona State University, Go Devils!! While he was grateful for those opportunities the hound of heaven continued to pursue him for his true calling, ministry. He studied at Columbia Theological Seminary and Master’s Graduate School of Divinity where he received first a Masters of Divinity and then a Doctorate in biblical preaching. COTM is his third ordained call. When he is not pastoring, he is a competitive strength athlete having won numerous medals in powerlifting, strongman and highland game competitions. His prayer is for all to know that Jesus’ love is for them wherever they are in life and that his love is able to cover all. His favorite scripture comes from Romans 8:28-39 reminding us that nothing will ever be able to separate us from the love of God found in Christ Jesus our Lord.